David Sengel is an expert in manipulating and embracing the innate qualities of his material of choice, wood. Within the Kamm Teapot Collection there are three Sengel works. Each of these vessels is alive with energy and dramatically displays the marvels of nature. 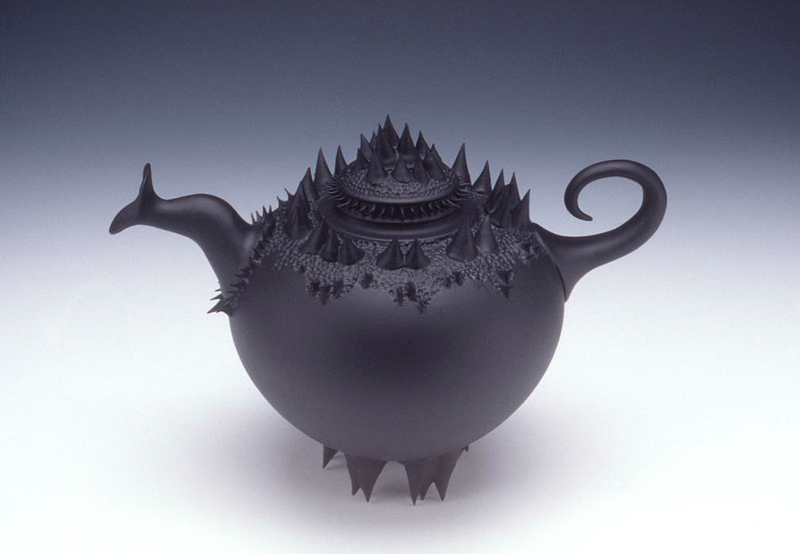 This blog post will focus on a lively, black, lacquered teapot by the artist. The form has a rounded globe-like body with a tapered curlicue handle and a curving spout. The upper surface is carved and accented with sharp thorns. These thorns also encircle the base of the spout and are utilized to create a foot. This is a whimsical work that emits a dark ominous feeling as well. In the 1990s Sengel began incorporating thorns in his woodwork. The idea came to him after receiving some locust thorns from an artist friend. [xi] This decision initiated an entire body of work with their inclusion. Sengel says, “I really hate to think how many thorns have passed through my hands…”[xii] These prickly additions provide an eye-catching tactile quality and have made Sengel’s work very “identifiable.”[xiii] Each thorn, which is gathered from various plant life, is sanded and meticulously adhered to the surface with tweezers. When you examine these creations, the thorns can feel menacing and their presence creates a barrier between the work and the viewer. A teapot, or especially a vessel made of wood, would normally encourage handling. However, in this instance, this norm is challenged. Sengel often utilizes a rich, dark, black finish. To obtain this result he has applied stove paint, black wax, dyes, shoe polish, or, as seen on this teapot, a lacquer. Countless artists have preferred a monochromatic effect for numerous reasons. For some, black unifies or simplifies a composition or adds an air of mystery. [xiv] For others, it “…contain[s] all color. It [isn’t] a negation of color…black is the most aristocratic color of all…”[xv] Sengel relies on his dark finishes to set the mood, act as a symbolic gesture, or perhaps it is a way to accentuate the form. [xvi] Undeniably, the decision to darken the surface gives his artwork a powerful presence. Del Mano Gallery. Collaborators: An Exhibition of One-of-a-Kind Collaborative Pieces. Los Angeles, CA: Del Mano Gallery, 2000. Lydgate, Tom. The Art of Making Small Wood Boxes: Award Winning Designs, New York, NY: Sterling Publishing Company, Inc., 1997, 133. Martin, Terry and Kevin Wallace. New Masters of Woodturning. East Petersburg, PA: Fox Chapel Publishing, 2008. Wesfarmers Limited. Surface plus Form: Craftwest Gallery. Perth, W.A: Wesfarmers, 2002. [i] Contemporary Craft, Transformation: Contemporary Works in Wood, May 7, 2009. [iv] Sengel attended Davidson College in Davidson, North Carolina where he was a music major. Sengel launched his piano repair and restoration business in 1972. [vi] Martin and Wallace, 190. [vii] Martin and Wallace, 190. [viii] Tom Lydgate, The Art of Making Small Wood Boxes: Award Winning Designs, New York, NY: Sterling Publishing Company, Inc., 1997, 133. [ix] Contemporary Craft, 2009. [x] Martin and Wallace, 191. [xi][xi] For well over ten years Sengel created works that incorporated thorns. He slowly left the thorns behind to explore other creative avenues. [xii] Martin and Wallace, 190. [xiii] Martin and Wallace, 190. [xvii] In recent years farming appears to be Sengel’s principle occupation. [xviii] In 1998 Sengel was in a major car accident. This had an impact on his life and his approach to working with wood. [xix] Martin and Wallace, 190.